Trading pullbacks is the darling of price action traders. 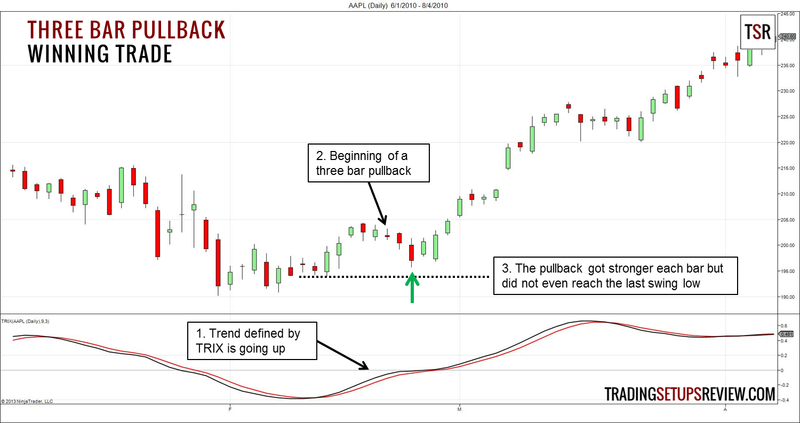 There are many ways to qualify a pullback and one of the simplest method is the three bar pullback. 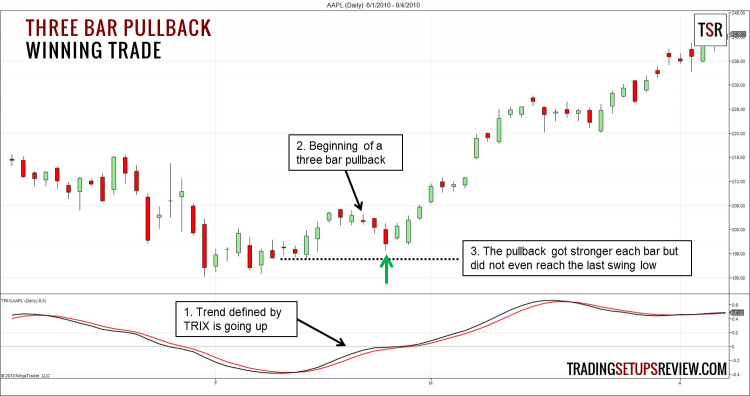 We are using his variant of the three bar pullback in this review. Lee Leibfarth used a triple smoothed EMA (TRIX) to define the trend. This is a daily chart of Apple Inc (AAPL). The lower panel shows the TRIX indicator. The TRIX line is black and its signal line is red. The black TRIX rose above its red signal line and defined an uptrend. Shortly after, we got a three bar pullback down. We bought on breakout of high of the third bar of the pattern. Regardless of your trade management, it is a challenge to make a loss on this trade. This is the daily chart of SPY, the S&P ETF. In Lee Leibfarth’s article, he tested his strategy on the daily S&P e-mini futures and the results were encouraging. However, in this example, we will zoom in on a losing trade. TRIX moved above its signal line to define a bullish trend. We got a three bar pullback down. The last bar was an outside bar. Outside bars are generally not ideal signal bars. We bought two days later as prices gapped up and triggered our buy stop order above the outside bar. After our entry, there were many days that gapped down and closed up. Such days could be bullish if they had strong follow-through. However, the market was clearly moving sideways and the trend did not resume. Unless you aimed for a very small target, the best outcome for this trade was break-even. This is a fine example of taking a basic price action pattern and improving it with your own techniques. Our trading strategies reflect our personality and trading mindset. In this case, TRIX works well as a trend indicator. Entering on a stop order when price breaks out of the last bar of the pattern helps to avoid patterns that actually leads to a trend change. If prices pullback for more than three bars, be very cautious. It is highly likely that the market will reverse or move sideways. 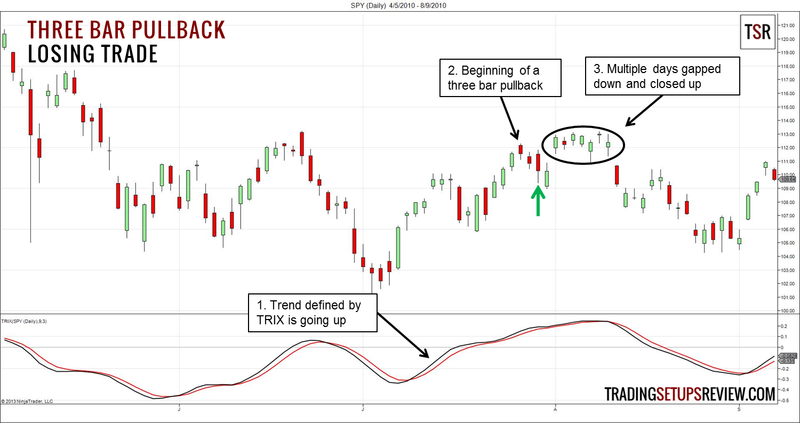 Using TRIX as a trend indicator is only a part of Lee Leibfarth’s improvisation. He also tested two sets of exit rules that improved the pattern’s performance. One set for short-term trades and another for trend-followers. Read his original article to learn more or do your own testing to explore further. “Three” is a familiar number to traders. Elliot waves count three impulse waves. We also have the three bar reversal pattern, and dozens of three bar candlestick patterns like three white soldiers and three black crows. Look out “threes” in the market. 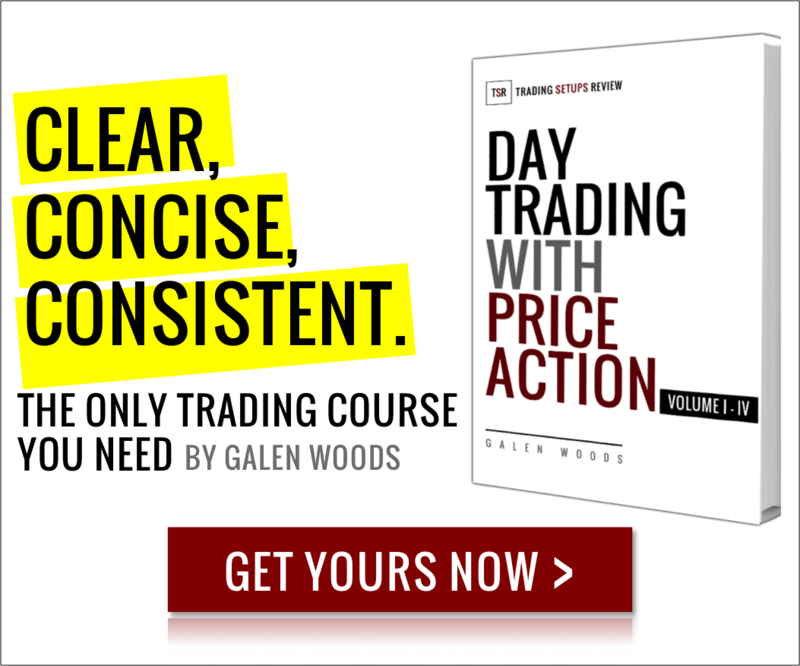 For another price action pullback trading setup, see Al Brook’s two-legged pullback. Hi Galen, Is there another indicator to use with this strategy other than the TRIX that would work just as good? Hi Al, I like using trend lines to judge the trend before looking out for this pattern. But if you are looking for a trading indicator, perhaps the ADX is what you’re looking for.